With this rising temperature and global warming, not everyone has a central air conditioning system because everyone can’t afford it. So fans are the best alternative to beat annoying summer. When hot weather becomes too much to bear, the fan is ready to delivered cool refreshing air but it’s not easy for everybody to take a large fan with them whenever it is needed. For this problem, portable fans are the ultimate solution as they are small in size and light weighed. 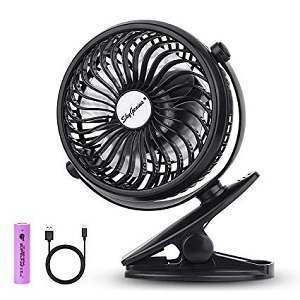 As these fans are portable you need to plug the fan into a USB port for power like USB outlets, computer, and laptop or power bank. You can use these fans for indoor as well as outdoor purposes. These are also useful when electricity is out also very useful for travelers. A fan will give you a fresh and cool feeling and keep the heat coming from the sun away. Here we are introducing many fans which will keep you cool anytime anywhere. In hot seasons we need a fan that lasting long. 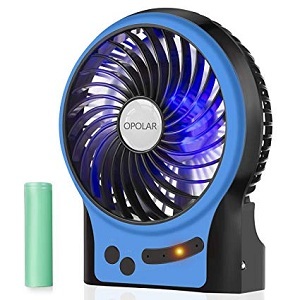 The Opolar battery operated rechargeable fans are a long lasting fan because it has two rechargeable 2600 mAh batteries, with the working time of 6-9 hours. Battery and USB fan is environment-friendly as well as energy saving. No one likes the noisy fans which disturb you while working. This fan is a quieter fan( noise less than 40 dB) which will not make a noise and keep a calm environment for your work and sleep. This fans having several power supply options so you will able to use it on batteries or via USB by connecting to a computer, power bank, etc. You can even keep on the fan with a wall adapter. You can choose wind direction easily according to your height or position because The fan has a 9-inch sturdy metal frame that can be adjusted 360-degree up and down manually. As the metal frame is easy to move so the blade can be cleaned easily. This fan is made with Twin turbo Cyclone Blade technology which provides maximum airflow to keep you cool anywhere. These fans are compact in size. If you want refreshing air during traveling you can use them as these are small in size. This lightweight personal fan perfect for use in the home, office, desktop, and camping too. You can enjoy cooling air circulation in any desired direction with 180-degree tilt rotation. It’s having speed settings with touch control for Low/High. For convenience and portability, fans are USB powered. 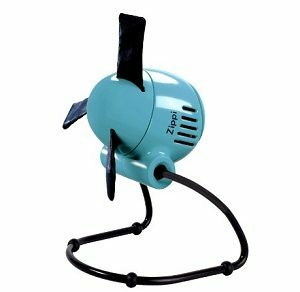 Are you searching for the portable fan for big rooms?? Then, this will be the best choice for big rooms due to its powered capacity. But the fan is small in size. It’s having a feature of two distinct speed settings, i.e., low and high and reverse airflow control which works manually. It has the two-pin polarized power cord for charging the device when powered out. 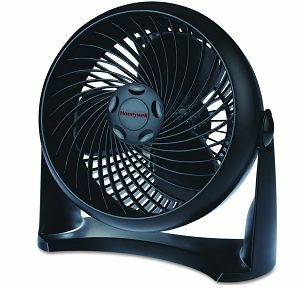 This fan works on the principle of more airflow, but less noise to give you a comfortable sleep. The maximum rotating speed of the fan is 3200 rpm which is enough to keep you cool personally. Low and medium settings are simple and super quiet which ensure the calm flow of air. This fans can be used for indoor as well as outdoor purpose. You can travel with this fan as it is compact in size so it not acquire much space. The blue internal LED lights infused in the fan gives attractive to look. Fan’s side light is quite bright and can be useful in dark areas or in the absence of electricity. You just need to plug the fan into a USB port for power like a USB outlet, computer, laptop or power bank, etc. It will be excellent for your traveling and outdoor plans. So include OPOLAR Portable Travel Mini Fan in your outdoor plans. Are you interested in unique and fashionable fan designs?? No need to worry now. This fan not only have the feature of unique design it also has the best performer features. This fan is strong and durable. Fans have Strong clamp & High versatility. Clip Style of this fan provides Clip on anywhere you want, good for the baby stroller, home and office, laptop, gym workout, car backseat, outdoors, camping, trips and anywhere needed. It can move 360 degrees vertical and horizontal rotation so it is easy to handle. Its high-quality motor gives high speed and low noise which will not disturb you from your sleep or work. 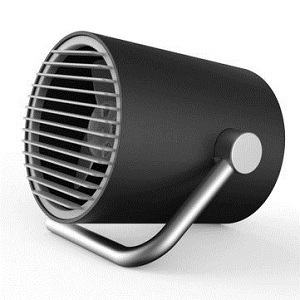 The additional feature of this fan is lightweight and compact in size so that you can carry it wherever you go. 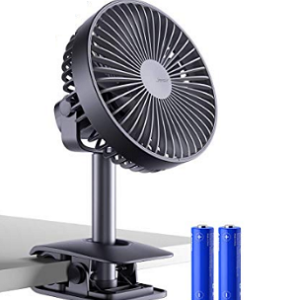 This air circulator fan has Aerodynamic TurboForce design for maximum air movement. This fan is compact enough for on a table or wall mount and powerful enough to help provide comfortable cooling in small-medium rooms. The Honeywell Turbo Force Air Circulator Fan has a 90-degree pivoting head which will be able to use for direct cooling or circulating the air. The fan has 3-speed select abilities which give added potentially reducing energy expenses. TurboForce fan’s user can be felt airflow of fan from 27 ft. away. they are enough quit which will not disturb you while working. With jesir Battery Operated Clip-on Fan, you can choose the speed that you want. This fan is operated with 4 different speed that is natural wind, strong wind, circulator wind, and sleep wind. Each speed has its unique specification as follows – Sleep Wind speed can work for 10 hours, Perfect for baby strollers, dormitory, bedroom, office. natural Wind mode will be able to work for 8 hours, best for beach, travel, trips, treadmill. Strong Wind works for 4 hours, ideal for camping, outdoor. Air circulator used for an indoor purpose which keeps cool in this hot environment. This fans easily clip on any position or anywhere you want with strong grip clamp. This fan brings you calm and powerful decent wind which suitable for your baby or family. Aomais rechargeable batteries fan gives 4.5 to 40 workings hours according to the speed setting. 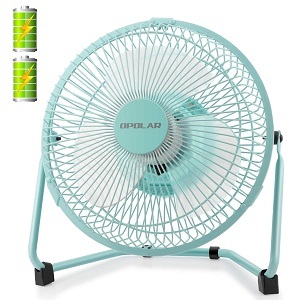 This fan is great for you if you are searching for the long lasting fan because it has Built-in 4400 rechargeable batteries. It can be carry or storage easily because of its compact size and lightweight. 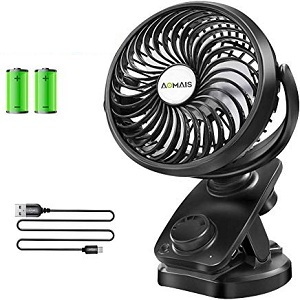 It is Multi Power Supplied & Wishper Quite Fan its The AA battery fan works best with one or two batteries or USB power sources. This USB clip fan is with the ultimate technology to control the noise when the fan works. The Portable fan provides 350 degrees vertical and horizontal rotation manually which keep you enjoy the cool wind at each angle.